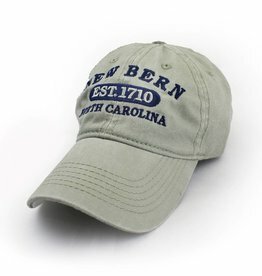 Our New Bern ball cap is 100% cotton ball cap with an adjustable back. The bill is pre-bent and the cotton is garment washed to create a vintage look and soft feel. The fabric color is sand/khaki and the embroidered lettering is navy.